ARP Haguro — Japanese Tier VII cruiser. A Heavy Cruiser of the "Fleet of Fog". Modeled after the Imperial Japanese Navy's 4th Myoko-class cruiser, Haguro. Equipped with multiple thruster modules, she uses exceptional speed and agility to overwhelm her opponents. Her Mental Model "Haguro" is known for her sharp tongue and lazy personality. Haguro acts as one of the "Secretaries" in the "Student Council of the Fog", along with Ashigara. 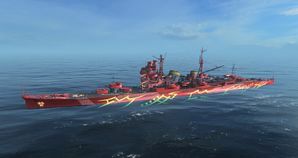 This warship has been specially designed for World of Warships, and is modeled after Haguro as she appears in "ARPEGGIO OF BLUE STEEL -ARS NOVA- Cadenza". Haguro is a powerful being in Arpeggio of Blue Steel manga and its Ars Nova anime adaptation, with enormous speed, numerous matter annihilating weapons, and a protective field that is impenetrable to any weapon developed by humankind. However, so the game does not turn into "World of ARP Ships" with a few insignificant human targets cowering in the background, the developers have declined to provide her with her true complement of abilities and weaponry. ARP Haguro performs exactly like the standard Myoko in the game (but without the ability to equip camouflage), and that means that she shares the same play style as the regular Myoko. You can refer to the article on Myoko for her performance appraisal. Does not come with overwhelming firepower, speed, submergence, Klein field, or super-graviton cannons of Haguro in Ars Nova. As a premium ship, ARP Haguro doesn't have any upgrades to research. As this is an ARP ship, the ARP Haguro cannot mount camouflage. Haguro’s Mental Model, and captain in the game. Haguro as she appears in Ars Nova Cadenza. Haguro as she appears in the game in Yokosuka port. Haguro as she appears in the game. Haguro (kanji: 羽黒) Heavy cruiser of the First Oriental Fleet and member of Hiei's "student council"
Haguro is one of Hiei’s subordinates and the youngest of Myōkō’s sisters. Her mental model appears as a high school student, in following the theme of Hiei’s "student council" that governs the First Oriental Fleet. Her uniform, which she has expressed her dislike of, is asymmetrical, matching Myōkō’s style, with the left side of her blazer being longer than her right, and wears a metal bracer on her right hand. She is somewhat childish and carefree, disliking being forced into doing things, and whines about the things she doesn't like. In the Ars Nova Cadenza movie, she is part of Hiei’s group, along with the heavy cruisers Myōkō, Nachi, and Ashigara, sent to hunt down and destroy I-401. Haguro (羽黒) was the third of the four-member Myōkō class of heavy cruiser of the Imperial Japanese Navy. She was named after Mount Haguro in Yamagata Prefecture. The other ships of her class were Myōkō (妙高), Nachi (那智), and Ashigara (足柄). Haguro saw significant service during World War II, participating in nine naval engagements. She was sunk during a fight with Royal Navy destroyers on May 30, 1945 at the battle of Mallaca Straits, becoming the last major Japanese warship to be sunk during World War II. Haguro under attack at Rabaul on 2 November 1943, showing damage received in the battle of Empress Augusta Bay that morning. US Army Air Force gun camera footage of Haguro under attack at Rabaul. This page was last modified on 29 June 2018, at 13:41. This page has been accessed 25,307 times.